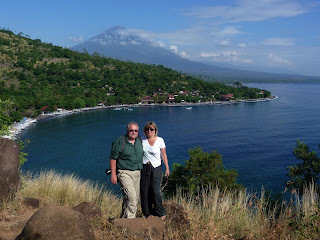 Bali Photography Tour, began on February 6, 2008 when i met two guests from Germany - Mr Hartmut and Ms Antonia. As a very compatible pair, they share the same hobby in photography. At that time, i received an opportunity to guide them in their exploration of the island of Bali for 6 days and 5 nights. My tour with them was following the routes suggested by their German guide book. The places we all visited are as follows: Kehen Temple, Penglipuran Village, Kintamani, Denpasar City, Denpasar Traditional Market, Bali Museum, NusaDua, Kuta Beach, Sanur Beach, Uluwatu Temple, Goa Gajah, Gunung Kawi, Tirta Empul, Stone Temple, Temple in Luk Luk, Sada Temple, Taman Ayun, Tanah Lot, Bunut Bolong, Rambut Siwi Temple, Buterfly Park, Jati Luwih, Batu Karu Temple, Pacung, Candi Kuning, Buyan Lake, Tamblingan Lake, Banjar Hot Spring, Brahmavihara Arama, Taman Sukasada, Tirta Ganga, Lovina Beach, Jagaraga Temple, Temple Beji, Medue Karang Temple, Gedong Kerttya, Amed, Kertha Gosa, Goa Lawah, Candi Dasa, the past 6 days I learned a lot about photography techniques. Apparently by accident, I discovered my talent for photography 6 day tour. It was during these 6 days that i learnt a lot about photography techniques, and unknowingly discovered my talent for photography. Since then, it has fuelled a desire in me to create a Photography Tour venture in Bali. My dream finally came true after I quit my job as a Driver Guide in one of the leading travel agencies in Bali. The main advantage of touring with us is that we are always on the look-out for great angles from which your pictures can be taken. Bali Tour Photography specializes in arranging tours according to your requests. Whether you are a professional photographer, a hobbist, or just interested in photography, let us guide you in our tours of Java, Bali, Lombok, Komodo and Flores. Our company has well trained guides who are experienced and ready to serve you during the tour. If you have any questions (or 'enquiries') regarding our tours, trips and any expeditions (group of people exploring together) you would like to request, please contact us directly. Please, CLICK HERE !